As noted previously, Anya and I will be making presentations in September at the writer’s conference in Albuquerque sponsored by the Historical Writers of America (HWA). We encourage you to consider attending this interesting conference. We don’t watch a lot of TV, but recently we caught an episode of “America in Color” on the Smithsonian Channel. This episode, “The 1930s,” included a short segment on the 1933 assassination attempt on president-elect Franklin D. Roosevelt, which plays a significant part in my novel, Illusions of Magic. A brief review of the Smithsonian episode is included below. Also, as usual, is “Wisdom with a Smile,” wherein we observe waiter backlash in a Paris café. Please tell friends who prefer reading a book made from paper that Illusions of Magic: Love and Intrigue in 1933 Chicago is now available at bookstores everywhere and can be ordered through Amazon, Barnes and Noble, Powell’s, etc. Finally, in “Sunny, With Afternoon Mediocrity,” I apply a bit of Elmore Leonard’s writing advice to a Booker Prize-winning novel by an acclaimed Indian writer. It’s July 4, 1966, but there’s no parade. Norm MacPhee downs some salt tablets, dons his flak vest, and climbs into the cramped cockpit of his U.S. Army Bird Dog surveillance aircraft. As he completes his pilot’s preflight checklist, his Marine observer belts himself into the tandem seat behind. 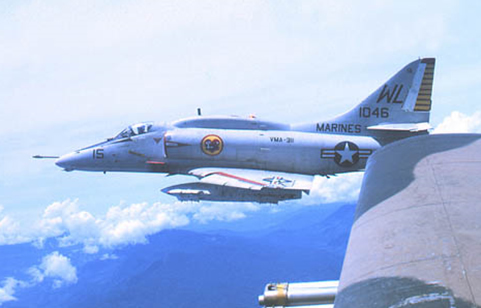 They’re flying out of Marble Mountain airbase on Vietnam’s Da Nang peninsula. If it’s like some flights in their high-wing, all-metal O-1, they’ll tally a three-and-a-half hour run over the assigned area, maybe charting suspicious movements and taking random potshots from enemy small arms. Then they’ll return and fill out the standard mission report. A company of 3rd Marine Division marines in the jungle below has come under heavy fire. They may be surrounded. Responding to their radioed call for aerial-observation support, Norm diverts and wheels his plane to the area. He locates the attacking force of several hundred enemy soldiers that threatens to overrun the Marines. He swoops low over the enemy, drawing their small-arms and anti-aircraft fire away from the Marine company. Within minutes, the first Skyhawks arrive. Norm circles the O-1, directing the A4 strikes on the enemy ground force. The Skyhawks inflict heavy casualties, eventually causing the enemy to abandon its attempt to overrun the embattled Marine company. Fifty-one years later, almost to the day in 2017, U. S. Army Chief Warrant Officer Norman MacPhee receives the Distinguished Flying Cross that was awarded back in 1967 for his actions on this harrowing mission. “For heroism and extraordinary achievement as a Reconnaissance Aircraft Commander,” and for “his outstanding professional skill and courage under conditions of extreme personal hazards,” reads the DFC citation from Paul H. Nitze, U. S. Secretary of the Navy, on behalf of the President of the United States. Norm’s a friend of mine and one of those everyday heroes you never read about. He and his wife live near us in Riverview retirement community. It was Independence Day, July 4, 1966, a day Norm well remembers. This credit is unusual in two ways—first, it promotes the song before the story is underway, and second, lyricist Mercer’s name precedes Mancini’s. “Moon River” later won Oscars for Best Original Song (1962). However, the film’s credit promotion hides a little-known mystery. I call it the Hidden Mancini. In what follows, I sometimes allude to musical concepts, ideas or details that may be unfamiliar. They are present to better inform those with musical knowledge. My thesis in this article does not depend upon such technical knowledge, but only on an appreciation of what I present as information, experience, and common sense. While “Moon River” is a straightforward waltz, this cut-time music is unusual. Following an unadorned F-chord downbeat, the melody begins with four climbing, unaccented notes (two eighth-notes and two quarter-notes) leading to the song’s highest note (D) on an unexpected chord. It is as if we’ve mounted five steps of a staircase to enjoy a breathtaking view. Accompanied by this unstable chord (a “suss”), the D holds a feeling of joyful anticipation. Following the chord’s resolution, a triplet of descending notes precedes the same three notes as quarter-notes with differing harmony. The result is a lilting—almost jaunty—rhythmic phrase that makes this melody memorable. The rhythmic phrases repeat as the harmony shifts from the initial key of F to A-flat, then appears headed for the key of C, but veers in the tenth and final bar back to the key of F. This section then repeats. The harmonic complexity increases in the 16-measure bridge that follows, with major sevenths and ninths leading to ever-changing key centers, eventually returning to the key of F to begin the final twelve-measure variation on the opening section. The music ends, strangely enough, in the key of C.
Lovers in New York say yes. The lyric relies completely upon Mancini’s original music and is unusual in matching the unusual cadences and rhythmic complexity of Mancini’s melody. Mathis, a careful and knowledgeable vocalist, probably thought “Lovers in New York” would catch fire, but it did not. It has, in fact, disappeared from common view, with only an occasional recording by unfamiliar vocalists being available. It has become one of those strange footnotes to Hollywood history—what I call the Hidden Mancini. This summer, TV’s Smithsonian Channel is presenting a series entitled “America in Color.” Episode 2 of the series is “The 1930s,” a review of major events during that decade. It starts with the stock market crash that signals the onset of the Great Depression. 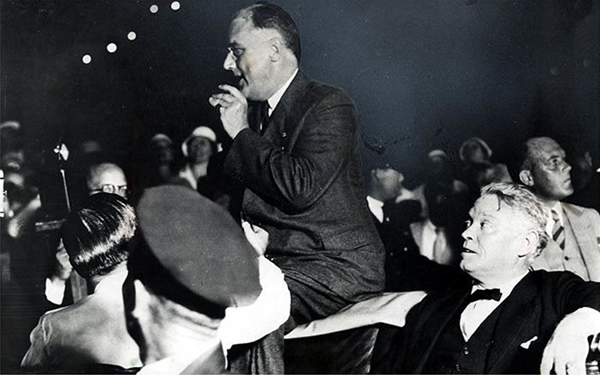 Following the 1932 election, President Hoover is replaced by Franklin D. Roosevelt, who promises a New Deal. But prior to his inauguration in March of 1933, Roosevelt enjoys a brief vacation, stopping in Miami, Florida after a fishing trip, where he’s almost killed. Because the assassination attempt and its aftermath is the real-life background of my novel, I paid close attention to the Smithsonian’s presentation. The episode does not cover the president-elect’s actions nor other events following the shooting, except to praise Lillian Cross as the person causing Zangara’s aim to go astray. Cross’s actions, however, are in dispute. Zangara, in particular, denied that Cross spoiled his aim. Instead he blamed his errant shots on his awkward position atop an unsteady chair (because of his shortness, he had mounted a chair to aim and fire his pistol). This coverage, although very brief, offers a needed reminder of this nearly-unknown assassination attempt on the newly-elected FDR. It omits, however, the dramatic events in Miami and Chicago during the nineteen days that Mayor Cermak survived his wounding. For more on those, and other exciting events, consult Illusions of Magic: Love and Intrigue in 1933 Chicago, or the forthcoming book Illusions of Magic, The Movie. However, as he sat writing L'Etre et le néant (Being and Nothingness), in a Left Bank café, he was approached by the waiter. Why this commandment? If the purpose is “only to create atmosphere,” Leonard says, the writer might want to forget the meteorology. Consider the opening of The God of Small Things, the Booker Prize-winning novel of 1997. The Indian author, Arundhati Roy, begins her novel with: “May in Ayemenem is a hot, brooding month. The days are long and humid.” Two sentences clearly at odds with Leonard’s Rule number 1, but we should read further. Here, I think, Roy veers into the mystical land of literary grandeur. Nothing remarkable about the days in Ayemenem—long and humid. But the nights, ahh, they are not just clear, they are spread through with ingredients unknown to India’s Meterological Department: laziness, with a morose outlook. Personally, I think some of Roy’s opening sentences are arresting. “The river shrinks and black crows gorge on bright mangoes in still, dustgreen trees.” The alliteration of “black” and “bright” is attractive. But one wonders when mangoes are not bright and crows not black? And does Roy need to remind us that mangoes grow on (green) trees? But wait—literature awaits. “Dissolute bluebottles hum vacuously in the fruity air.” These bluebottles are not just flies, they are empty, inane creatures lacking moral restraint. Who knew? Next, according to the author, the bluebottles crash into windows, where they “die, flatly baffled in the sun.” I get the dying part, but why are these flies baffled? Perhaps Roy’s opening would be more readable had it observed the matter of Hooptedoodle, Elmore Leonard’s colorful branding of wordy writing that most readers either endure or skip.